Another important thing to look for in an instructor is sign of total belief in what he is teaching. Has he been tested? Has he used it for real? If he hasn’t had to defend himself, then in what other ways has he tested his art? To what degree has he trained? I know from experience some instructors don’t take too kindly to being scrutinized, they like to be king of the hill, and as they certainly have acquired some skill over time and ably display it now and again, they give the impression that they know what they’re doing, even as they remain tight-lipped over their story. However, to my mind, the “right sort” will be far less reticent than this and you should, at least, without having to probe too far, be able to discern if they are the “real deal” or not before very long. Look for related incidents, scrapes, training exploits and episodes where techniques were really tried and tested against considerable force; your instructors attitude should shine through in all of this, he should be able demonstrate the worth of his knowledge through narrative without hesitation. You should see evidence of certitude, which is freedom from doubt, not just through the demonstration of certain “moves” but through his “perspective”, through his words: i.e. this works because…we do it like this, because…when I did this once, this happened…so on and so forth. We’re looking for evidence of empirical knowledge, over and above the mere repetition of what has been taught for an eon (this is not to undermine the purity of tradition, mind you). Do you honestly believe he can handle himself? Stare unmitigated hate and aggression straight in the face and remain undaunted, downing it even before coming to blows? 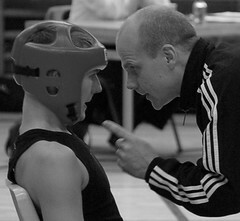 Because one day your instructor may be confronted, and what are you going to think if he crumples in fear? What use your champion’s skill if he’s unwilling to use it, in times of grim need? Talk of personalities all you like, the idea of this not being in your nature, you’re not wanting to fight….when it comes to the crunch, what are you really going to do? Instructor’s, sufi’s, sensi’s, are no different, and to my mind you want to be under one who has completed his training and turned base metal to gold. Someone who knows without a doubt what works and what doesn’t and doesn’t hold back in telling you where you need to improve, what you need to know, and of the dangers there are. Yes training is fun. We meet with our friends and build up a sweat and make better our skill and harness our motives…but in the end, we’re either going to get a rude awakening some night on the town and wake to the fact we’ve been poorly instructed and that our efforts were futile - or know that we’ve, as they say round my parts, “tain the right path“. Be honest with yourself, ask now and again, even if you think you’ve found the right place: Is this working for me? If your answer is consistently yes, then you’ve probably found someone of character you would want to stay under. A really good post. I can’t being to tell you the amount of times i’ve asked myself and others these questions as its so hard to find a good school. Even if you don’t have a preference when it comes to style it is still extremely difficult to find the real deal. Hopefully with a guide like this it will make the life of many pupils much easier when finding a class to join. A bad start is the most difficult thing to recover from. Hi, really appreciate your comments, I agree, the real deal is hard to find, and sometimes you’ve got to make do with the best available until something or someone better comes along – but hopefully people will be honest and brave enough with themselves to realize where they are being complacent. The journey’s got to be about handling more, being more, fearing less etc. Really enjoy your blogs. You’ve managed to both condense and expatiate in a very lucid style, the core issues that are at the heart of Conflict and our responses to Conflict – mental, physical and the most difficult one of all – emotional. Cheers belltoller, I really enjoy writing these posts, though often I feel like I am just skimming the surface and that really the truth lies deeper “within” – where I think is all of our power. But, you know, blogs and martial arts are such they take focus and practice and patience and a heartfelt commitment to staying the course; and as always these things are helped by the encouragement of friends, so thank you for that.